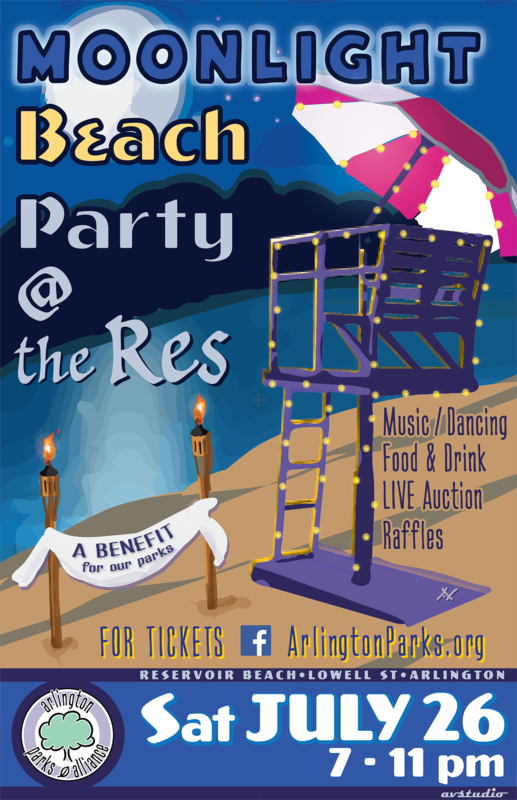 Moonlight Beach Party at the Res!! Join us on Saturday, July 26th for a fun filled evening of music, dancing, food, drink, live auction and raffles. 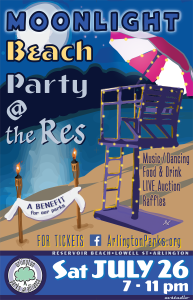 The Arlington Reservoir beach will be transformed into a paradise under the stars! Enjoy a fun adult evening with a special catered dinner as we raise funds and awareness for Arlington parks. The event will take place from 7 pm to 11 pm and tickets must be purchased prior to the event. Tickets are $65 each or $120 per couple. The event is being co-sponsored by the Arlington Recreation Department and the Arlington Park Alliance. For more information about the Arlington Parks Alliance (APA), visit www.arlingtonparks.org. Thanks to Joe Connelly for setting this up!